Video content is now becoming important. Most of the social media websites are now focusing on video content. We also know that video makes a better impact than articles or photos. But for video content, we all need a good video editing software. There are various video editing softwares available in the market, but very few software actually works smoothly. 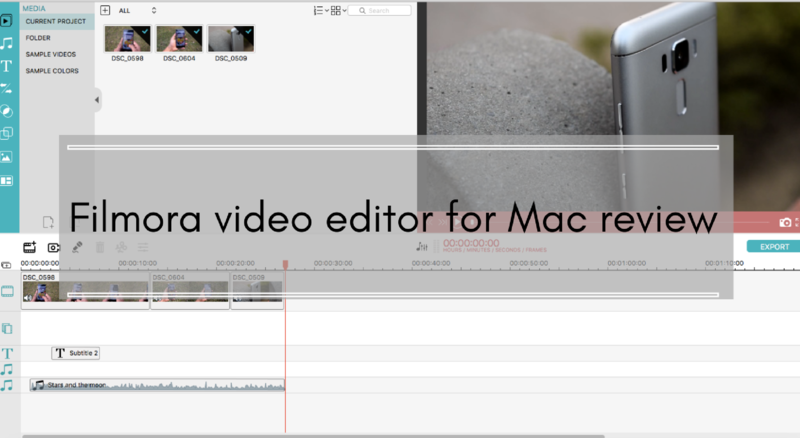 In this article, I am going to talk about a popular and good video editing software Filmora from Wondershare. Filmora can be used to create or edit from small personal videos to professional videos like short movies. I have been using the Filmora on my MacBook for past few days and here are my views about the software. Filmora is for beginners who have less idea of video editing and need easy to use solution but with powerful video editing capabilities. Filmora for Mac comes with good looking and easy to use interface. When you initially open the software, it asks you to select either start with an existing project or create a new. Select any of this. You will surely love the UI and colors it uses in that. It is fast and lightweight. While processing videos, it uses resources and it is nothing to worry as video editing is a complex task. In the primary software window, you see three main sections. The lower section is video timeline where you can put different things including video clips, texts, photos and audio for the video editing. The timeline also has a toolbar just above it for various operations on the clips. These options change based on your selection. For the selected photos, the options will not be the same as in the selected video. The right part of the top section is the preview. It shows the preview of selection. This is a video player or photo viewer to check the clip or photos preview. You can also switch to the full-screen viewer for having the better idea of the video you are editing before finalizing anything. The left side of the top section shows the media files for the current project. These are videos or photos you uploaded on the software for the current video. You also have a menu at left side for the media section. You can browse different things including video effects, music, texts, transitions, layout, and effects. This is the important menu and you must check all. You have most of the options here. All you need a good creativity to sense what kind of thing you can include making your video better. Filmora has plenty of options that force you to ditch your current free video editing tool. It supports various file formats to work with. You can split, fast forward, slow, add photos, add effects to videos, add text. Timeline view helps a lot. It supports drag and drops to add different things. Yu can different elements to add in the video. You can add texts of specific pre-designed design as you can see in the screenshot below. You can even customize these effects as per your need. Not just video editing, you can also enhance the videos by adding filters. I am sure you will like these effects. These effects are music like Instagram filters to enhance and make the video more appealing. Wondershare keeps on adding more filters every month. There will be new package every month. Use this link to check effects store. Wondershare keeps on adding more filters every month. There will be new package every month. Use this link to check effects store. You also do not need to search for stock music as you get the built-in option for music within the software. You can use these music tracks and add in the videos. The only thing I missed was the connectivity with the external camera. I could use only Facetime camera of my iPhone as external video recording option. Filmora supports various formats for output. The best thing is that it supports 4K video format in export. You can even directly export the video to YouTie, Facebook and Vimeo. It also supports the writing data to a DVD disk. Filmora is a nice video editing tool that offers most of the video editing options you can look for in a video editing tool. As the tool is simple and easy to use, beginner users will find it good. But the tool is powerful enough to use for professional videos. If you are looking for a professional but cost effective option for video editing, you can check the Filmora from Wondershare.